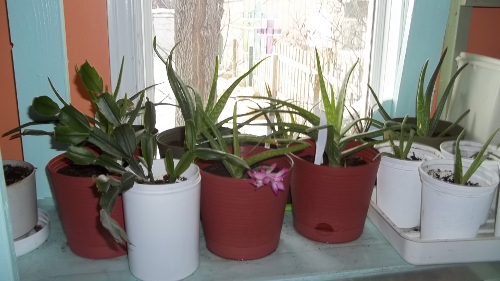 I thought I'd show you photos of my aloe vera plants over the years, since we all like to see photos so we can judge for ourselves, how much this person cares for her plants. 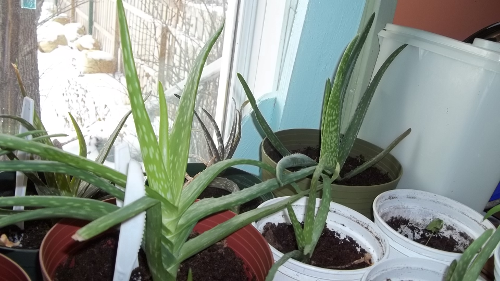 So brace yourself, this page is FULL of photos of my aloe vera. I'm just sorry I can't quickly find one of the first one we got from my Gr'ma Kroeker. That was before the days of digital cameras, so I may have one somewhere in a box of prints. That would take us back to the 1980s when she moved in with us until there was an opening in the nursing home. First a few peeks into the Sunroom at my parents' home in Hague, where I first started multiplying Gr'ma Kroeker's aloe vera plant. This was the centerpiece of the room. 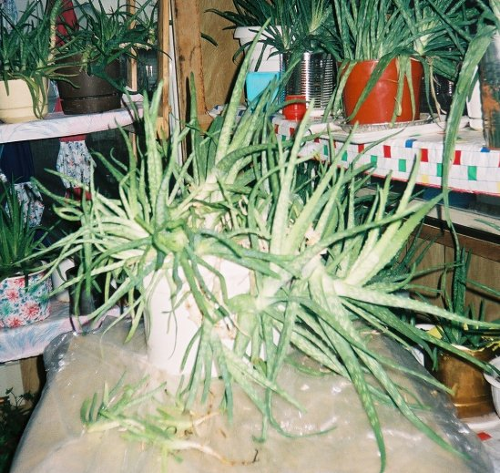 A pail full of aloe vera plants that kept multiplying all by themselves. 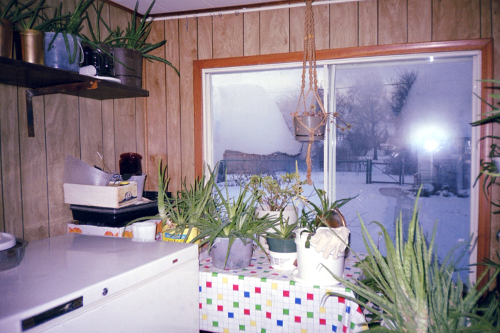 Yes, I often marvelled too, at how the plants seemed to thrive in this sunroom which was like a sauna in the summer and quite cool in winter. 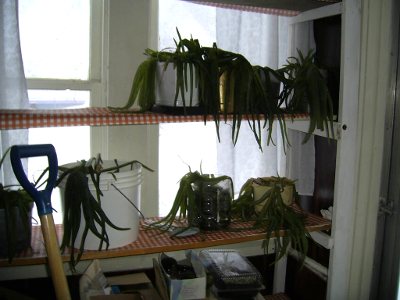 At one point I counted 76 pots, pails, yogurt tubs, etc., all full of aloe vera plants! This was the north side of the sunroom. Dad put up as many shelves for me as he could manage. This was the south side of the room. We got a shelf up above the chest deep freezer. Here we turn back to the west window with the cluster of aloe vera plants on the small table there. It usually took me about half an hour to water ALL the pots and containers on a Saturday morning. The rest of the week I ignored the plants unless we needed some. 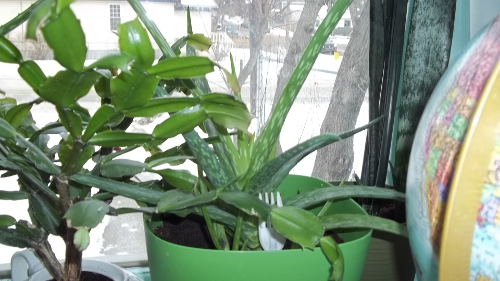 Another large pail full of 26 aloe vera plants! Yep. I counted them. You may notice some small baby offsets lying on the table in front of the pail. They stayed there for several weeks while I scrounged around the house for more containers I could claim to turn into pots. (I think there was a delay too as I waited for spring so I could dig up garden dirt for the containers). 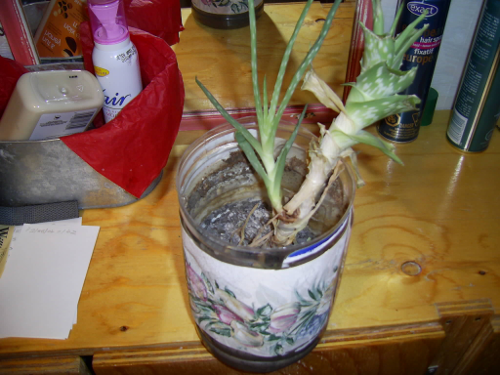 Now this is a lonely aloe vera plant I kept down in my bathroom in the basement. 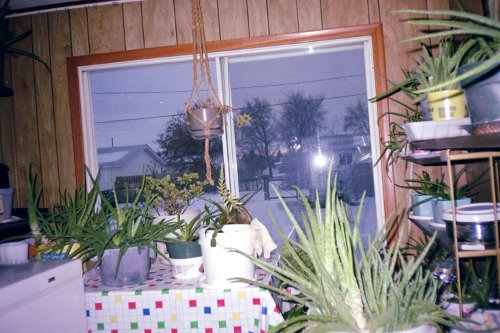 It got no sunlight, and because it was not with the others in the sunroom I often forgot to water it for weeks and months at a time. That faithful plant stayed green and was there when I needed a pinch for a scratch, an itch or a hang-nail... whatever. 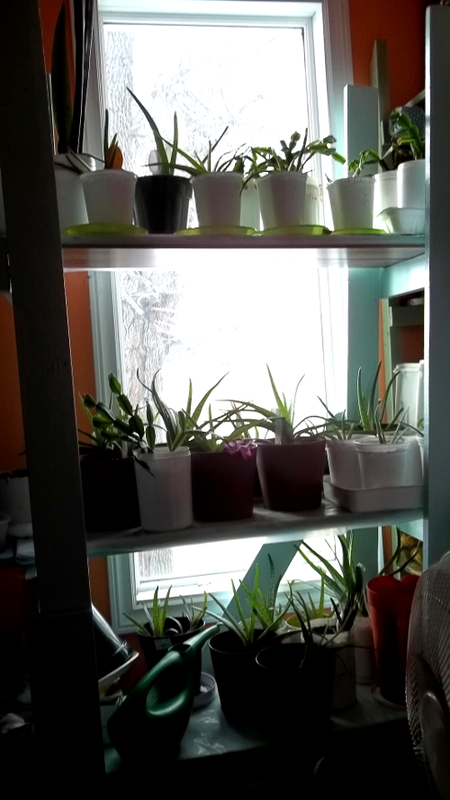 When I moved to Saskatoon in 2007 I could not sell or give away all my plants, and since I didn't have enough window space right away for all of them in my tiny house, I put 45 of them them in the front porch until I could solve the problem. Unfortunately, a harsh fall frost arrived suddenly one night, catching me off guard. The next morning the plants in the porch had all died and hung their leaves, black and limp. I had to dump them in the garden for compost. 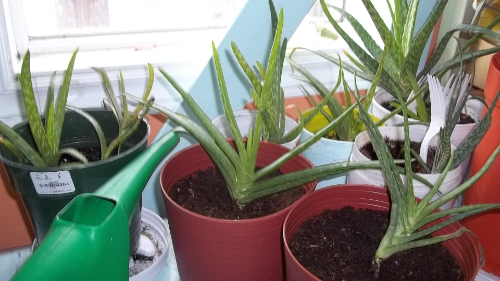 Happily, I did have six small aloe vera plants indoors, and I've been building up my stock of aloe vera plants again from those. Some time later, towards spring, I pulled up some of the young offsets and prepared to plant them. 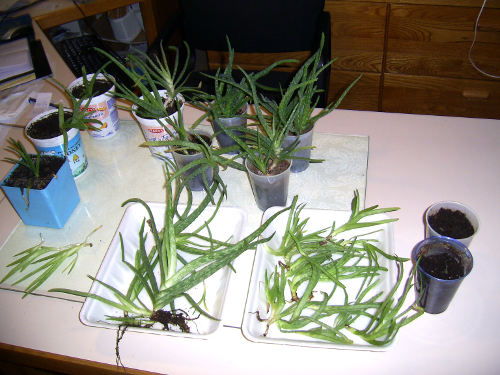 Here are more small aloe vera plants ready to put into pots of their own. Here they are in pots of their own. At least a few of them in this view. 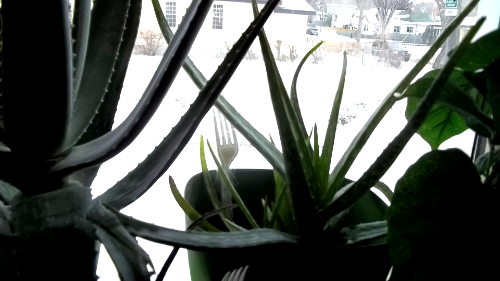 Let's leap forward to just a week ago - (end of February, 2018), when I decided to take some photos to show my current stock of aloe vera plants. I had done some re-potting into bigger pots in the fall. Those plants have had a growth spurt this winter. This is a closeup of two of the plants on a shelf in this south window. 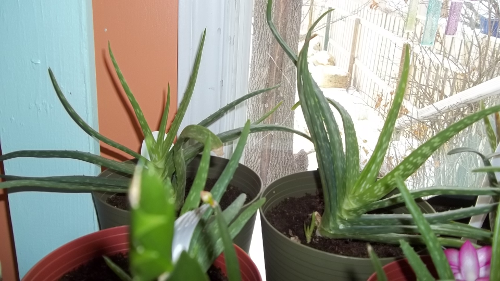 More closeups of some of the aloe vera plants. 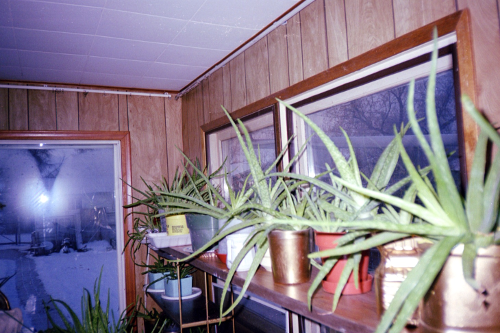 A cluster of aloe vera plants on the middle shelf. 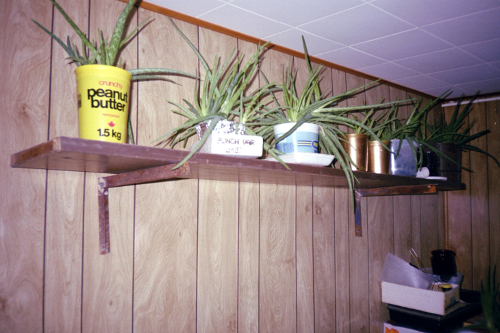 Some of the bigger aloe vera plants on the lower shelf. 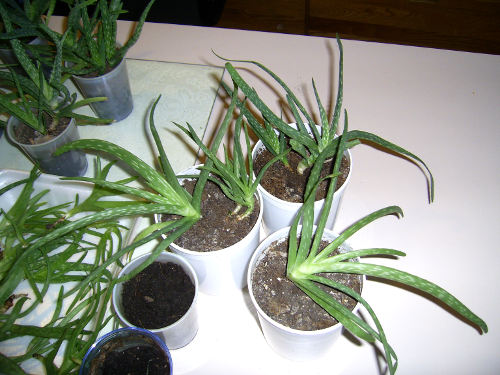 Note: it takes patience to grow aloe vera plants from small offsets. I think they grow shy if you watch them non-stop; so you need to have other things to do in the meantime. 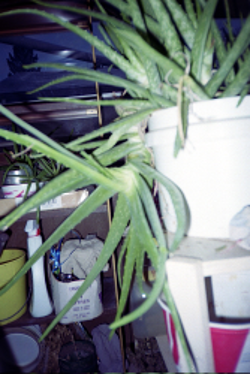 Just a shift of the camera and there are more aloe vera plants. 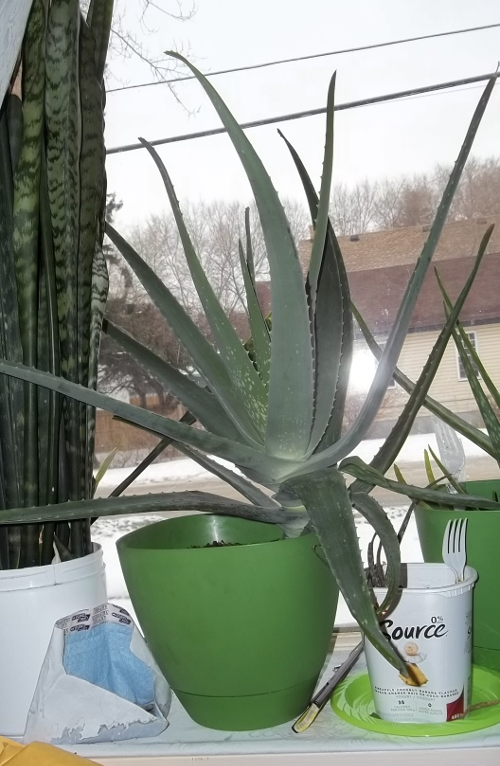 We'll go see some more in other windows of my house, but altogether, my current count is 33 aloe vera plants of varioius sizes. These are the plants in the upper east window in my office/living room. There is a huge Christmas Cactus and other plants mixed among them. 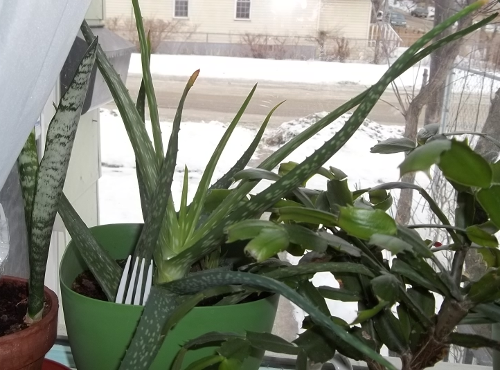 Two large thriving aloe vera plants in my north-facing office window. Focused here on the left one. 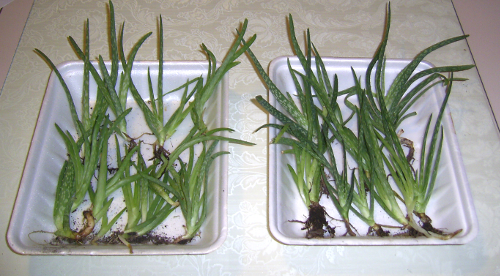 This is the aloe vera on the right. 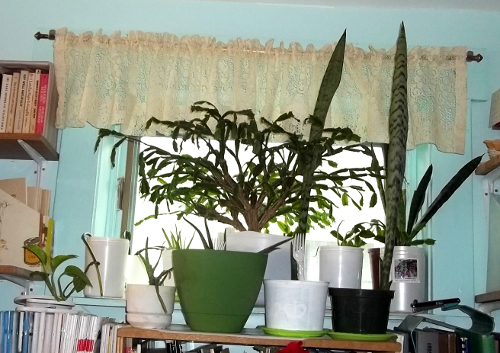 Finally, going to my bedroom window, also facing north, we focus first on the smaller aloe vera plant... with a hint of the Biggest one in the house to the left! Here it is! My biggest aloe vera plant at present. Doesn't it look handsome? 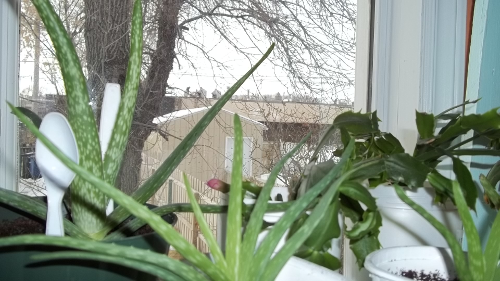 Oh yes, I must not forget that I have two more small aloe vera plants, on either side of a cactus, in the bathroom window. (Facing west). Incidentally, if you are wondering why I have white plastic cultery stuck in some of the pots - the reason is to help prop the plants up until they have put down a firm root. 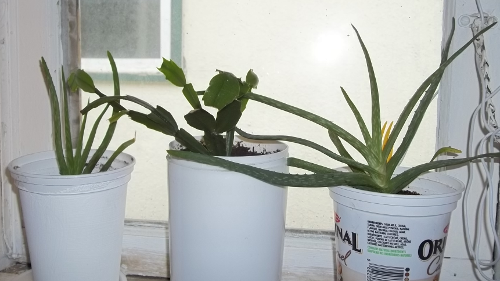 Also, in the fall I had some problem with mites, and one tip I found online was to wrap sticky tape around sticks and put them into the pot to catch those mites. I just wrapped the tape around the forks and knives, and it seemed to do the trick.